We have known for years that Big Oil companies like BP sponsor iconic arts institutions in the UK as a way of greenwashing their image and helping the company with its “social licence to operate”. Its not rocket science why companies sponsor the arts: Oil is dirty, it pollutes and causes climate change. By sponsoring revered arts institutions such as the British Museum, National Portrait Gallery, Tate and Science Museum, BP buys into their image and portrays itself as clean, caring and green. The oil company has always maintained that its arts sponsorship comes with “no strings attached” – that its dirty money is some kind of altruistic gift. But a new report, published by the Art Not Oil Coalition, which has been campaigning against BP’s sponsorship of the arts for years, reveals that this is just is not true. It also exposes that BP is not only buying a clean image but also buying influence over museums and politicians. It raises deeply awkward questions. 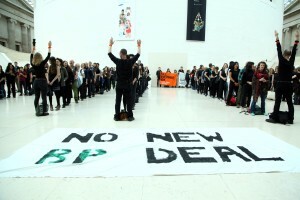 Via its sponsorship of museums, BP has been caught influencing exhibition content and events; co-ordinating security responses to protests and even using the museums to lobby key decision-makers, giving the oil company privileged access to politicians. Indeed BP’s behaviour is described by British Museum staff as “unpleasant” and “extremely demanding of the Museum – bullying, I would say”. The report, BP’s cultural sponsorship: A corrupting influence, is based on months of painstaking research which draws upon hundreds of emails and documents released under the British Freedom of Information Act. Probably the most damning revelation is that, in return for hard cash, BP had influence over the running of the museums and galleries it sponsored and in some instances had influence over curatorial content. For example, BP was offered “input into curatorial decision-making” at the British Museum’s Indigenous Australia exhibition in 2015 and the National Portrait Gallery’s BP Portrait Award. The timing of some events seems particularly uncanny. In late 2015, BP donated additional money to the British Museum (beyond other donations in its five-year sponsorship deal) in order to fund a Mexico-themed “Days of the Dead” festival in collaboration with the Mexican Embassy. The festival occurred at the same time that the company was bidding for lucrative oil leases in Mexico. BP’s sponsorship of the festival allowed BP to gain privileged access to Mexican government officials, specifically at a VIP reception event. You can tell how sensitive the whole episode was as one email from the museum’s Events Manager asks the Mexican Embassy to delete the invitation list for the event “as soon as it is no longer required”. But probably more importantly for the company, sponsoring events at the British Museum, Science Museum and other venues gives BP privileged access to UK politicians and policymakers. BP and the Science Museum even worked together on “advocacy plans” for the 2015 General Election. The report is already makes waves. The Museums Association is now investigating whether any of the arts institutions have broken its code of ethics in the way they have dealt with BP. The campaign against BP’s sponsorship is also gaining pace. The British Museum and National Portrait Gallery are both currently considering whether to renew their sponsorship deals with BP. Tate’s partnership with the oil giant will end in 2017, following intense pressure from artists and campaigners. These new revelations will only add to that pressure.